Have you ever wondered why we all love and need music? During his presentation Junior Fellow John Pape answered that very question. 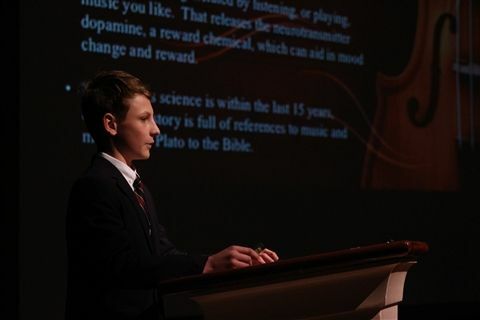 John taught the middle school audience all about how music positively affects our brains and body chemistry. He discussed how researchers, using the latest technologies, have proven that listening to music stimulates complex brain activity. John then discussed his original piece of music entitled, “Happiness.” In this piece, John drew upon his research, emotions, and violin training to evoke feelings from his audience. After it was performed by two special guests, cellist Linda Atherton and violinist Collista Koh, the audience was most certainly impressed and happy! Congratulations, John, on an informative presentation.